Fr John Burke SMA passed away in the morning of 19 November 2006 at St James’ Hospital, Dublin. He returned to Ireland in August for leave and medical assessment. He had been extremely ill in recent weeks and his condition deteriorated rapidly over the past few days until his passing in the early hours of Sunday morning. John came from Donoghmore in Limerick and was born on 22 February 1942. He received his primary education at the local national school and his secondary schooling at Sexton Street CBS in Limerick City. He came to the Spiritual Year programme of the Society of African Missions at Cloughballymore, Kilcolgan, Co Galway, in 1960 and took temporary membership of SMA on 23 June 1961. He attended the SMA House, Dromantine, Newry, Co Down for philosphical and theological studies. He became a permanent member of SMA on 14 June 1966 and was ordained at St Colman’s Cathedral, Newry, on 19 December 1966. He was assigned to Nigeria where he was based for most of his missionary work. He was first appointed to the Diocese (now Archdiocese) of Ibadan where he spent 12 years: 1967-1978. he worked in various parishes including Oke-Ado and Ikire. In 1978-1979 he was on sabbatical study leave for which he was based in Rome and graduated with a Masters Degree in Theology. In 1979 he was reassigned in Nigeria to the Archdiocese of Lagos where he has worked ever since apart from a two-year breeak (1990-1992) when he was in Ottawa, Canada, for studies in Canon Law. his assignments in Lagos included time in Surulere, Festac, Agege-Ipaja, Satelite and until his recent illness he was on active assignment in the parish of Sacred Heart, Apapa, Lagos. His Canon law qualification he put to good use in the production of several booklets on various aspects of Church law as they applied to the life of Christians. He is sadly mourned by his sister, Mary, and his brothers, Patrick and Michael, as well as by nieces, nephews and other relatives and friends. His passing is deeply regretted by fellow members of the Society of African Missions (SMA) and the Archbishop, priests, religious and people of the Archdiocese of Lagos, Nigeria. 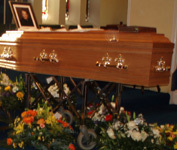 His remains were removed from SMA House, Blackrock Road, Cork to St Joseph’s SMA Parish Wilton on Monday 20 November. The Requiem Mass was celebrated on Tuesday, 21st November and was followed by burial in the adjoining SMA Community cemetery. Fr Fachtna O’Driscoll SMA, Provincial Superior, was the main celebrant of the Mass. He was assisted at the altar by John’s classmate, Fr Fionnbarra Ó Cuilleanáin SMA, fellow-Limerickman, Fr Seán Hayes SMA, former co-worker in Lagos, Fr Dan Murphy SMA and former schoolmate, Fr Tom Ryan of Limerick Diocese. The great number of concelebrants included many SMA priests and representatives of the Augustinians and St Patrick’s Missionary Society. Music for the Mass was provided by the local Wilton Church choir and was led by Fr Cormac Breathnach SMA. Brother Jim Redmond SMA was at the organ. The large attendance included Missionary Sisters of Our Lady of Apostles, Franciscan Missionaries of St Joseph and Presentation Sisters. The esteem with which the parishioners of Sacred Heart Parish, Apapa held John was evidenced by the attendance of Mr Emmanuel Kazoboh (Vice-Chairman of the Parish Pastoral Council), Mr Emeke Egikeme (member of the Parish Pastoral Council), Mr Adejare Doherty from Apapa who is based in London and Mrs Julianah Edewor-Thomas from Apapa. At the end of the Service, tributes from Anthony Cardinal Okogie, Archbishop of Lagos, Bishop John Moore SMA, Bishop of Bauchi in Nigeria, and from Fr Basil Soyoye SMA, Superior of SMA House of Studies, Ibadan, Nigeria, were read. A graveside oration was given on behalf of parishioners of Apapa by Mr Emmanuel Kazoboh.